OGV is an open and royalty-free lossy video compression format designed by the Xiph.Org Foundation. This format can't be widely used. If you have lots of OGV files and want to play them on some devices like PSP, iPhone, iPad, iPod touch and so on, you need to convert OGV to MP4, MOV, or other formats for uses. After conversion, you can also edit them in iMovie, FCP, or play them in other some MP4 compatible applications. Convert any video format including OGV to MP4, MKV, AVI, 3D, and HD videos. Convert video to any format without quality loss at 30X faster speed. Convert OGV directly to your portable devices like Android and Apple phones or game devices. One click to burn OGV files to DVD disk to play with your DVD player. Supported OS: Windows NT4/2000/2003/XP/Vista/7/8, and Windows 10 (32 bit & 64 bit), Mac OS 10.14 (Mojave), 10.13, 10.12, 10.11, 10.10, 10.9, 10.8, 10.7, 10.6. For Windows users, just get below how to convert OGV to MP4 for Windows (Windows 10 included). For Mac users, please learn how to convert OGV to MP4 for Mac with the similar steps as the Windows version. Step 1 Load OGV videos to the OGV to MP4 converter. Click Add Files icon to import your local OGV videos to this program. Or simply drag the OGV videos from your computer to this app. When you load the OGV files, they'll appear as thumbnails in this software's left item tray. Note: If need, you can re-adjust the order, re-name the files, preview them by clicking the video thumbnail, or join them together into one file. Step 2 Choose MP4 or the device you want as the output format. This software offers you MP4 and optimized formats for most devices in its format window. Just select your ideal output format according to your need. First, click the format icon in the Convert all files to pane to open its output format window. To select MP4, you can go to Video. If you want to select some device as the output format, just go to Device category to select what you want. Step 3 Customize your video files (Optional). 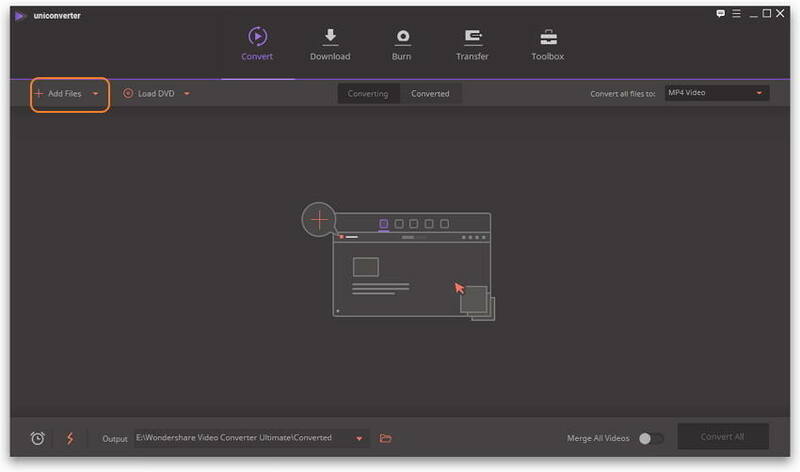 Besides video conversion, this Video Converter also lets you edit your videos. 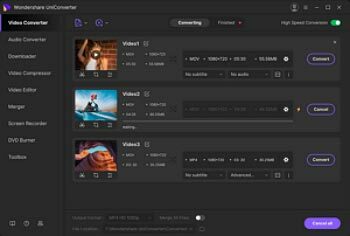 With its powerful video editing tools, you can join several video clips, trim, crop, rotate videos, set video brightness/contrast/saturation, and add video effects and subtitles. (Simply click the icons below video thumbnail to access various video editing tools). Step 4 Start OGV to MP4 conversion. 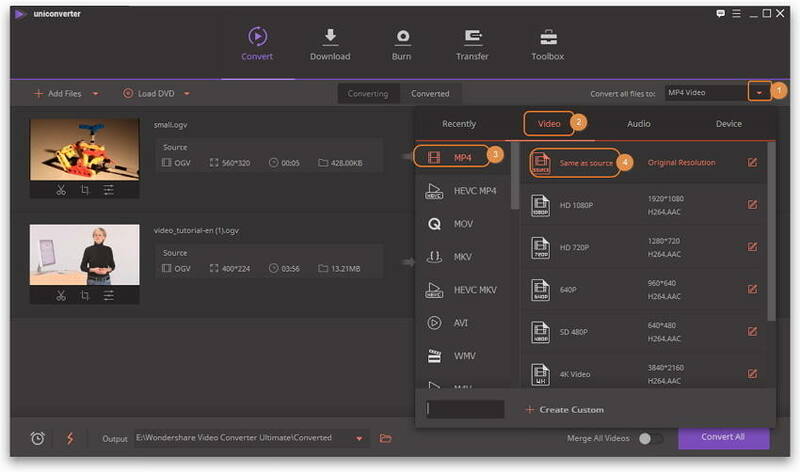 Click the Convert All button to perform OGV to MP4 conversion. The video conversion will be over in minutes. You can see the conversion progress according to the purple bar. After conversion, simply click the Open Folder icon to enjoy the output files. If you need to transfer them to your device for entertainment, just connect the device to PC and then transfer videos from PC to devices. If you want to convert OGV to MP4 free, you can try Wondershare Free Video Converter which is completely free but with some limits. A complete free OGV to MP4 video converter to let you easily convert any common videos. Edit videos with the basic video editing function. Allow you to download YouTube videos without limitations. An easy to use interface to make things much easier. Supported OS: Windows NT4/2000/2003/XP/Vista/7/8/10, Mac OS X 10.14 (Mojave), 10.13, 10.12 - 10.6. Note: The process of converting OGV to MP4 is much similar with UniConverter (originally Wondershare Video Converter Ultimate). Step 1: Download, install and launch the free OGV to MP4 converter. Step 2: Select the output format as MP4. Step 3: Start converting OGV to MP4. Include common videos, and HD & 3D videos. Include common videos, and HD & 3D videos. 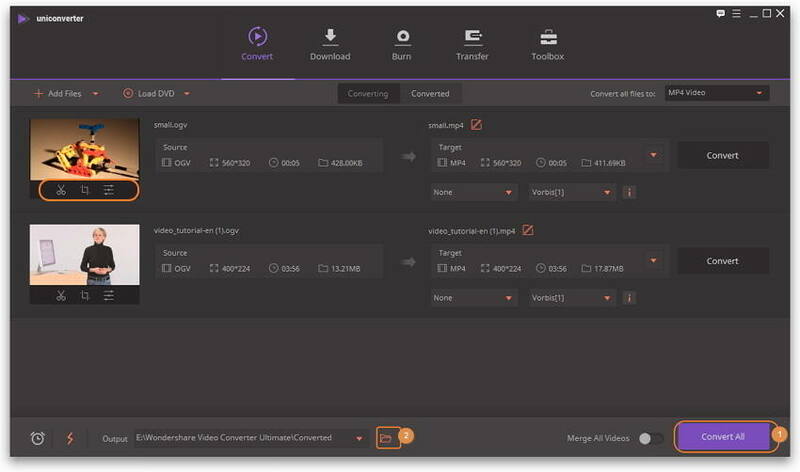 As an all-in-one video converter, UniConverter (originally Wondershare Video Converter Ultimate) has its advantages over Video Converter Free. 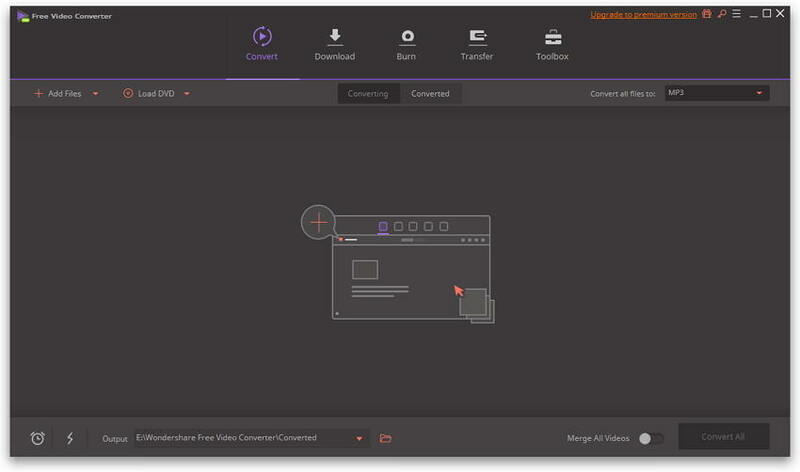 If you are looking for an advanced and powerful video conversion tool, just try UniConverter (originally Wondershare Video Converter Ultimate) below. MP4 to PS3: How to Play MP4 on PS3 Smoothly?